A list of publications made using the OSCI Toolkit. 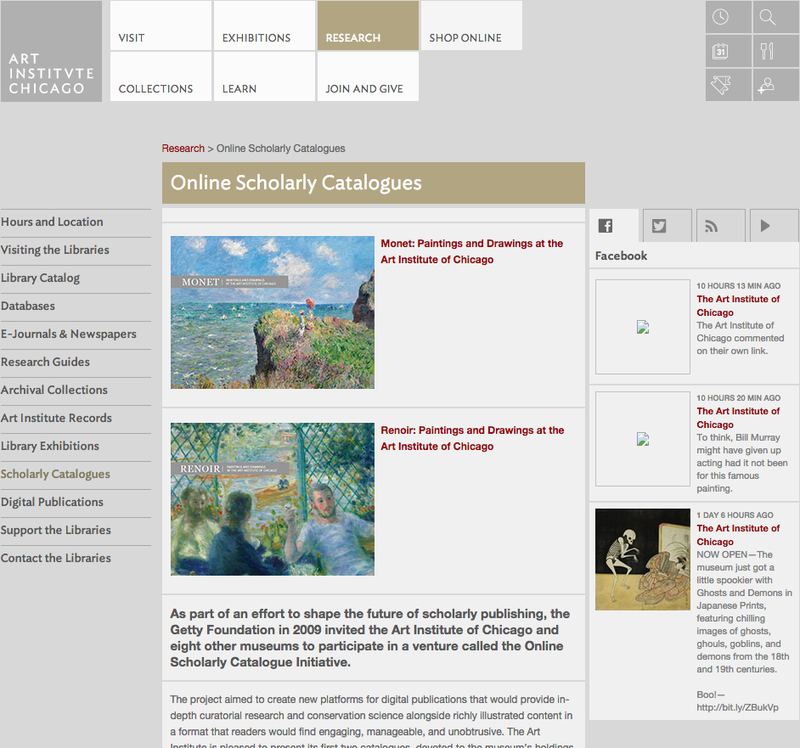 In 2010, the Art Institute of Chicago engaged the IMA Lab of the Indianapolis Museum of Art and began work together to design prototype software for an online catalogue of works by Monet and Renoir in the collection of the Art Institute of Chicago. Envisioned as a tool for art historians and other scholars, the team took inspiration from existing printed materials—wishing to add the best interactive features of the web without compromising the scholarly nature of the text. In 2011, after months of curatorial research and technical study, the Art Institute of Chicago released brand new scholarship highlighting Claude Monet’s Beach at Sainte-Adresse and Cliff Walk at Pourville in addition to Pierre-August Renoir’s Laundress. These initial catalogue entries were released as part of a usability test of the prototype software developed by the Art Institute of Chicago in collaboration with the Indianapolis Museum of Art. These and other catalogues can be found on the Art Institute of Chicagos's website. Working with the chairs of the Museums and the Web annual conference, a digital publication was produced for the 2012 Selected Papers proceeding print publication. The scholarly content was a perfect fit for the OSCI Toolkit. A group of volunteers entered the papers into the OSCI content management system from provided source Word documents. The resulting EPUB document was disseminated for free to all registered attendees of the conference and is available for purchase by others. Visit the Museums and the Web 2012 Selected Papers digital publication page on the MW website for information on how to access the EPUB document.